Interview with Karen Barbe, handmade textile designer. In the world of design, hand-crafted objects are always special. Meet Karen Barbe, a textile designer who crafts her creative business by hand. You quit your day job and started your own handmade line of textile home wares and accessories – how did that come about? I had worked for a couple of years – first as a Product Manager Jr. for PUMA Chile and then as an in-house designer at Concha y Toro Winery – when I felt I lacked something. I had always enjoyed crafting and embroidering. Making textile objects with my own hands had been my approach to design and the main reason I had chosen to pursue a career in it. So I needed to come back to it. I had gained enough experience in product development and marketing and had a good sense of colour. I quit, moved to Stockholm for a couple of months and started blogging. That’s how it all began. Do you believe that culture is still a strong influence or has the world become too similiar everywhere? When it comes to trends or fashions, they are pretty similiar all over the world. We end up seeing the same designs everywhere (deer, owls, nesting dolls, moustaches, to a name a few that have been around lately in the indie – and not so indie – world) and everybody seems to want the very same things. But I do believe each culture and country, despite globalisation, are still rich of identity, stories and cultural raw materials to inspire design in a unique way. In my case, I find myself inspired more by Chile’s modest spirit and soul than by its traditional visual imagery. 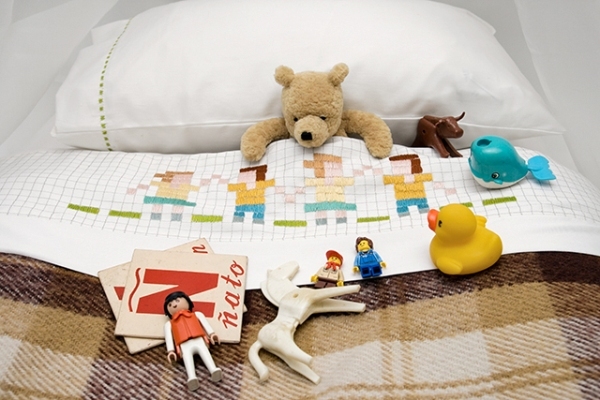 Organic cotton sateen sheets for a baby’s crib, stitched and hand-embroidered. Have you always made things by hand? Since being a little girl! My mother has always been crafting, sewing, knitting, embroidering, crocheting, painting, you name it; so it was natural for me to start crafting as well. She always had a lot of materials to play and experiment with, I’m very thankful of that. You said you love things that are simple and unpretentious –what are the other things that excite you? Books, languages and history. I’m mostly an armchair traveller, so I like to read a lot and imagine different places and ages and how things were done before our time, how people spoke and looked like. 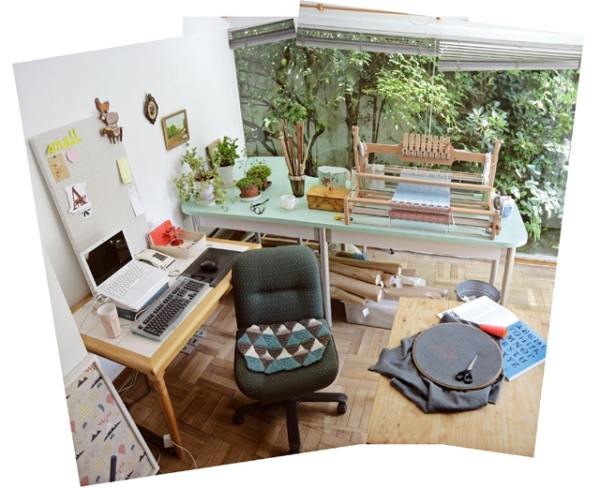 Karen's Studio: with her three workspaces – her laptop, her table loom and her embroidery hoop. I start my day checking emails and reading blogs while I’m having my breakfast. Then I do some computer work and after that I prepare the orders of the previous days and go to the post office to deliver them. When I’m out I like to visit some of my suppliers or favourite shops to see if they’ve got some new fabrics, yarn or materials. I come back, have lunch and take pictures. The after-lunch hour is the brightest time of the day inside of my studio so I prefer this moment to take all the photographs I need for my blog and shop. Then I follow with some more computer work or some crafting, like embroidering or weaving. Tea time and keep on with the work for a little more. Then go out for a walk or meet friends. I fold up the day reading or watching a movie (currently seeing Akira Kurosawa’s filmography). The pin cushions, the embroidered tea towels, the hand woven scarf – the patterns are simple and comforting – what do you think of when you create? I mainly think about other textiles, their structures and craft techniques. I always have in mind, making textiles about textiles. But also things like a picture in an old magazine, a vintage find, a forgotten and shabby shop somewhere, a piece of traditional craft, inspire deep feelings or sensations I want to soak my designs with: nostalgia, cosiness, familiarity, persistence in time. 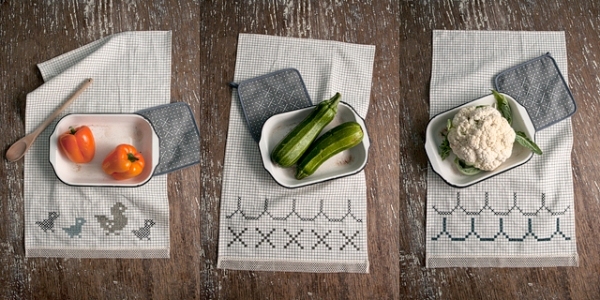 Hand embroidered tea towels, inspired by cross-stitch motifs & trimmed with vintage cotton lace. How did having a blog change the whole journey? Well, my blog’s been the real journey! It’s paved the path for my textile wares brand (Karen Barbé | Textileria) and what’s more important, it’s helped me to find my own style and voice as a designer. It’s a continuous practice of trying to be the designer I want to be. Besides it’s allowed me to meet hundreds of new people around the world who share a similar vision with me and have helped to spread the word about my work. In retrospect, what lessons/beliefs helped you along the way? The “follow your dream” motto has been my inspiration during these years as a freelancer and entrepreneur. There have been times when I’ve felt like quitting because things hadn’t gone as expected but I’ve kept on despite the obstacles and time has proved me right. One way or another things end up working out and your dream looks again closer and achievable. So the lesson is, don’t give up. Your tutorials are beautiful. I especially loved the darning one. Could you share it with us? Of course! This one has been especially popular: how to make patches to mend your jumpers or clothes. If you don’t have something torn to repair, get creative and use these small weavings as applications, coasters, brooches, etc. For full directions see here. 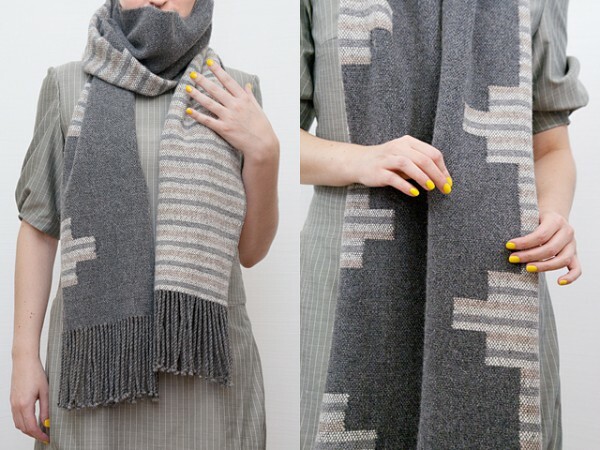 Scarf handwoven by designer Karen Barbé in Merino wool, Angora and Alpaca. Thank you for sharing your wonderful handmade world Karen. *All photographs courtesy Karen Barbe. About the Author:Kavita believes in serendipity. She is insatiably curious, interested in a million different things, in love with the idea of love and has an endless list of things she wants to learn and do. 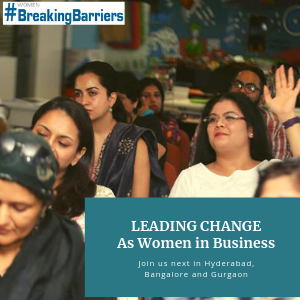 She runs a blog named Indian By Design, likes styling interior spaces, loves helping people get closer to their dreams and is happy to have discovered the joys of sewing and crafting. The specifics may change but the essence would be the same!! Oh! and I also love what it says in your little profile- …believes in serendipity. She is insatiably curious, interested in a million different things, in love with the idea of love and has an endless list of things she wants to learn and do. I am thankful for the little directions you give me in reaching my goals and dreams. And this little nugget of an interview is one more gentle push in the right direction for me. Thank you Kavita and Karen. What a lovely interview and what an inspiration. I absolutely love the work and the simple workspace. I love the idea of not giving up on your dream. This interview is so personal, thank you ladies for the warm feeling with my morning chai. Love the relaxed-almost therapeutic pace of the interview. Love the idea of working by yourself, for yourself. What a nice interview you have made, it is such a lovely blog post! I’m an admirer of Karen’s work for some time now and I find this very nice to read. I am also an admirer of Karen’s work, so I find it fascinating to read more about her, listen to her thoughts and see more of her work space. Thank you! I really liked it. It wasn’t rushed, it was slow and easy. A lot like the whole hand crafting procedure. It had a lovely mood about it. And I felt I was listening to 2 friends talk. Really nice. This is wonderful. Looking forward to more. Loved the flow of the entire conversation. Also,it was so relatable. Simple and beautiful. A big hug to you all. Thank you for taking time to share your wonderful thoughts. I am glad you found it relatable, personal and inspirational. 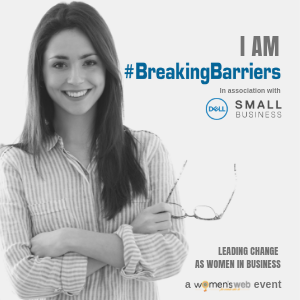 I loved the opportunity to get to know Karen a bit better and take a close peek at what she does and how she does it.